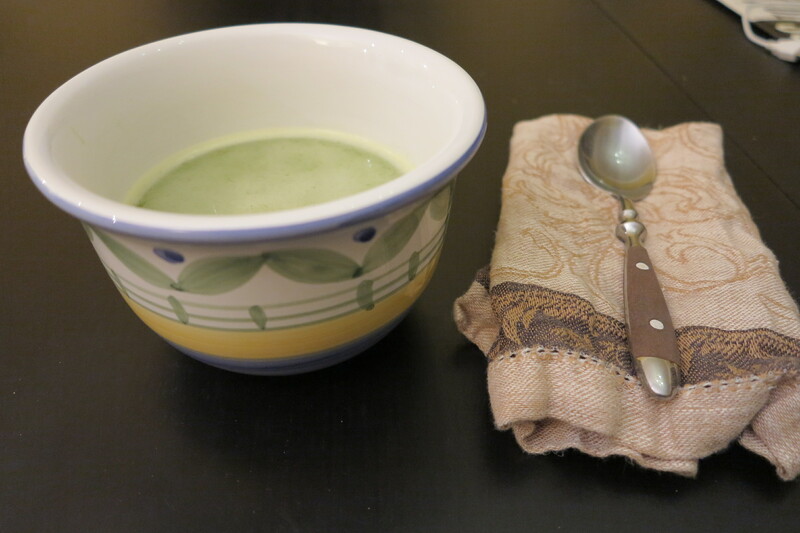 Running more than a bit late with last week’s French Fridays with Dorie recipe, Cheating-on-Winter Pea Soup. I actually made it a few weeks ago, but then I was skiing last week and didn’t get a chance to post until today. I can’t tell you how happy skiing makes me. Maybe it’s the Vermonter in me… actually, I’m quite sure that it’s the Vermonter in me… but there is nothing in the world that matches the feeling of swooshing down a snowy mountainside. Sigh, as you can maybe tell, I wasn’t quite ready to come home. But soup! Today we are talking about soup. Dorie’s pea soup, made at any time of year with frozen peas, was quick and easy. I made it on a weeknight and had dinner on the table in 20 minutes flat. The resulting soup was a bit thinner than I had expected, but tasty nonetheless. The leftovers are sittin pretty in my freezer, ready for a late night when I have no time or energy to cook. This entry was posted in french fridays with dorie and tagged Around my French Table, seasonal - winter, soup, vegetarian. Bookmark the permalink. come in handy when you need it. Glad you had fun skiiing. Have a great week. The soup was a perfect warmer-upper! My mother is a Vermonter, although I believe she now prefers sunshine and heat. Sounds like you had a wonderful ski weekend, Rose!! Your soup looks delicious…I love quick and easy, and this soup fits that category! We really enjoyed it, too! Rose, I hope that you had a wonderful vacation! It sounds like you really enjoyed this easy winter soup – it was a nice recipe and you are right, it will be good to have on hand when there is no time or energy to cook one of these evenings. Rose your soup looks scrumptious! Your ski trip sounds fun. I have never skied but I would like to try it. At least you made yours in advance. I went out of order with this and the couer a la creme! I just got back from being gone for a week and haven’t made this yet – gonna give it a try this week! Glad you had fun on your ski trip! I am running behind as well but for less fun reasons- I managed to pick up a cold. Luckily it was after I ran around last week with Nana and got to see the Barefoot Contessa (probably the crowd where I caught the cold :). Glad you enjoyed skiing-we go to Vt and I am the only one who doesn’t yet ski. Maybe someday- though then they won’t have my day long cooking to come back to:)This soup was a surprise hit in my home. My expectations were low since I am not a fan of peas. I will go for a thicker version next time and my guys definitely want a “next time”. Dorie inspired me to play around with more soups as this was truly easy and tough for me to rationalize not having time to try. I think skiing is more fun than making soup, certainly! This one was good, quick, and tasty.